A team of university scientists has developed the world’s first artificial kidney technology to be implanted in the body. Their bio-hybrid approach uses living kidney cells in tandem with a series of specialized microchips powered by the human heart to filter waste from the blood stream. The National Kidney Foundation estimates that over 100,000 patients are on the waiting list for a donor kidney, and over 3,000 are added list each year. The average patient spends 3.6 years waiting for a viable transplant, and may be treated with dialysis while they wait, but only one in three dialysis patient survives longer than five years without a transplant. Transplanted organs from deceased or living donors must be carefully matched in order to avoid tissue rejection, but an artificial solution could potentially bypass these complications and be manufactured to better meet the demand. To address this unmet need, William Fissell from Vanderbilt and Shuvo Roy from the University of California, San Francisco (UCSF) launched The Kidney Project. “This project is about creating a permanent solution to the scarcity problem in organ transplantation. We are increasing the options for people with chronic kidney disease who would otherwise be forced onto dialysis,” Fissell told the UCSF News Center. In November 2015, The Kidney Project received a $6 million grant from the National Institute of Biomedical Imaging and Bioengineering (NIBIB). According to Fissell, the group also reached out to both the National Institute of Health (NIH) and the FDA in a more coordinated effort to bring the artificial kidney to clinical trial. Under a cooperative agreement with the NIBIB’s Quantum Program, the NIBIB will oversee funding for The Kidney Project’s research for another four years. The prototype is roughly the size of a coffee cup and uses a combination of silicon nanotechnology and living kidney cells to filter blood. A series of 15 microchips serve as scaffolding for the living cells to grow on and around, creating a bio-hybrid device. “We can leverage Mother Nature’s 60 million years of research and development and use kidney cells that fortunately for us grow well in the lab dish, and grow them into a bioreactor of living cells,” explained Fissell in a recent article published by Research News @ Vanderbilt. Fissell described the device as a “Santa Claus System,” because it can reliably distinguish between waste chemicals and those nutrients a body should reabsorb. According to Fissel, the device is powered naturally with the patient’s own blood flow, and his team is working to ensure that blood can flow through the device without clotting or causing damage. Vanderbilt biomedical engineer Amanda Buck is using computer programs to study the device’s fluid dynamics and further refine the channels for maximum blood flow efficiency. The team announced that they were ready to begin pilot tests of their silicon filters, and they intend to launch the first human clinical trials for the artificial kidney technology as early as 2017. Last year, CNN reported that the University of California, Los Angeles (UCLA) had introduced technology that would allow patients to receive continuous dialysis treatment; an advance that scientists claim reduces many of the side-effects and inconveniences of the treatment. 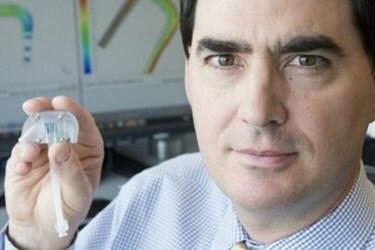 This technology, said lead researcher Victor Gura, could be available in two years.